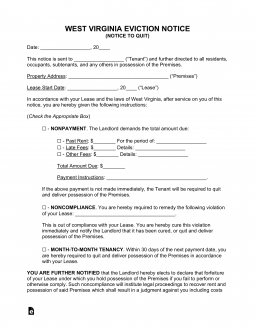 The West Virginia eviction notice forms are not necessary to inform a tenant of an eviction because of a lease violation. However, for the sake of trying to avoid dealing with court filings, it may be beneficial, depending on the situation, to tell the tenant that you intend on moving forward with eviction if they don’t move out. In any case, you don’t need to provide notice and can proceed directly to the Local Magistrate Court to file an eviction case called “Unlawful Occupation” or “Wrongful Occupation”. The court will schedule a hearing no more than ten (10) days from the date of filing. If the landlord prevails, tenant will have to vacate the property. Immediate Notice to Quit (Non-Payment/Non-Compliance/Illegal Activity) – The West Virginia State Statutes do not have any laws written to give notice to the tenant for any type of lease violation (according to § 55-3A-1). Therefore, if this form is distributed it is the landlord informing the tenant of their situation before a petition is filed against them. 30-Day Notice to Quit (Month to Month Tenancy) – This form may be used to inform a party to a month-to-month tenancy that the other party does not intend to renew the tenancy. In West Virginia, tenant must pay rent on the date it is due and since there is no notice requirement, landlord may go straight to court to have the tenant evicted without notifying tenant. Tenant can pay to stay, but it would include all back rent plus any costs and fees associated with the eviction process. Step 1 – In West Virginia, a landlord does not need to provide notice to tenant if they are in default of the lease, wither through non-payment of rent or some other breach. Landlord can go straight to court and file an eviction proceeding. However, depending on the situation, it may behoove the landlord to let the tenant know there is a problem and give them a chance to rectify it assuming you’re ok with the tenant remaining if they rectify the situation. Step 2 – Landlord may proceed to the Magistrate Court with Jurisdiction in the Area in Which the Rental Property is Located and file a Complaint, also known as a Petition for Summary Relief – Wrongful Occupation. The tenant will have to file an Answer by the time of the court hearing which will be no more than ten days from the filing. Step 3 – If the landlord prevails, the court will set a date for when the tenant myst vacate from the property. If the tenant still does not move out, the landlord may ask for a Writ of Possession from the court, which authorizes the sheriff to make sure tenant leaves the property. Save the “West Virginia Notice To Quit” by selecting the “PDF,” “ODT,” or “Word” buttons below the jpeg image on the right. Also, ready a valid in effect copy of the Rental Agreement that is at the heart of the Notice you are issuing. Below the Recipient Name will be two statements meant to introduce the Property and the Lease this Notice holds in its consideration. The first term to require information will follow the term “…City of.” There will be an area to fill in the Name of the City where the concerned Property is located. The second space to be tended to will follow the phrase “…County of” where you must report the City where the Leased Property is found. The Zip Code of the Leased Property will need to be supplied after the phrase “…State of West Virginia, Zip Code. This statement will also require the Building Number and Street listed for the Property. If the Leased Property has a separate Unit Number a space at the end of this sentence has been provided as it must be reported. The Signature Date listed on the Lease for the applicable Rental Property must be presented in the next sentence. This will be in a written format in the spaces around the phrase “day of.” You will need to enter the Calendar Date, Month, and Year. Next, we will need to specify the subject matter and Terms to be conveyed through this document. This may be done by selecting the check box next to the Notification you wish to issue. The first three Notification Statements have been developed to address Tenant Recipients guilty of an unacceptable violation. The last two Notification Statements have been developed to provide the Notice required when ending a Month To Month Tenancy. To notify Tenants that an Overdue Payment of Rent must be submitted immediately upon receiving this document or they must return the Property identified above to the possession of the Landlord, mark the “Nonpayment” check box. To notify Tenants who have committed a violation against Lease Terms that their transgressions must be corrected or release possession of the Property immediately, mark the “Noncompliance” check box. To notify Tenants, who are guilty of an “Illegal Activity,” that as a result of breaking the law they must vacate the Rented Property in Three Days, mark the “Illegal Activity” check box. The illegal Tenant activity must be reported on the blank line in this statement. To notify Tenants in a “Month To Month Tenancy” of the expiration of their Lease, mark the fourth check box. The exact Date the Landlord desires this agreement to end must be reported across the spaces in this statement. Note: This day may be any Date Thirty Days after the next Date the Tenant is expected to pay rent. To notify Landlords, in a “Month To Month Tenancy,” of the expiration of their Lease, mark the fifth check box. The Tenant must provide the Desired Termination Date by reporting the Day, Month, and Year in this statement. This Date is required to be at least Thirty Days after the next Payment Date. The Delivery Agent will need to document the Day, Month, and Year of the Calendar Date this notice was Delivered on. Additionally, this party must report the Name of the individual who accepted this paperwork. Both of these pieces of information may be reported in the Certification Statement in the “Certificate of Delivery” section. Next, the individual delivering these documents must check one of the three Delivery Method statements. It is strongly recommended the Agent filling out this portion of the form read these statements carefully before attempting Delivery and mark the appropriate one at the time of Delivery. The Certificate of Delivery demands for the Signature of the Deliverer on the Signature Line provided in order for this section to be considered valid.